Philips ToUcam Pro is a very good camera for astrophotography. For image analysis it is important to know exact exposure time. By using the camera you can discover soon that the exposure time set in camera's control panel doesn't conform the real exposure time. So I decided to measure the real exposure time. 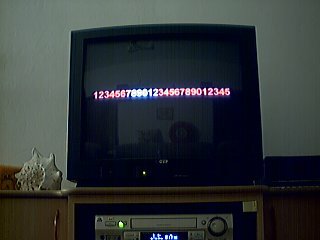 TV screen shows digits, each digits is displayed in one frame - i.e. 40ms. In Corel PhotoPaint I created a set of 25 bitmaps with numbers. 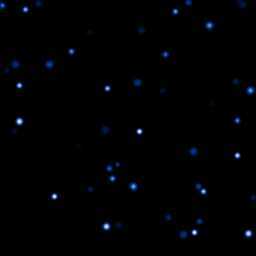 Each bitmap corresponds to 1 frame and contains one digit highlighted. I load the sequence to K3CCDTools and generated AVI sequence with frame rate 25fps. Then I load the sequence into VirtualDub and appended it several times untile I had 20 minutes of video. Usually I play the sequence directly to computer video output connected to TV set. The measured cameras are connected to laptop and capture the TV screen. However, ToUCam Pro is not compatible with my laptop so I had to connect it to my desktop computer. That's why it was necessary to record the AVI sequence to videorecorder (it is not possible to exactly play video to TV output and record AVI from webcam simultaneously).